Simon & Schuster/Paula Wiseman Books, 9781481467018, 32pp. * Imagination reigns supreme as siblings Jinx and the Doom take on chores and play with the superhero power to make even the mundane magical. . . . With similar pacing and themes to Jacky Davis and David Soman's Ladybug Girl books, this tale offers the refreshing twist of sibling friendship that parents will applaud. 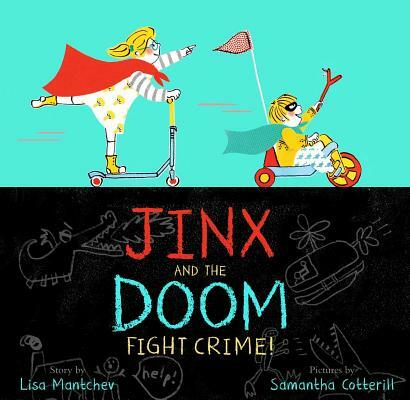 Jinx and the Doom will captivate readers with their irresistible fun. A high-energy read-aloud for any young fans of superheroes, sibling dynamics, and a fun take on cooperation. Cotterill’s vivid images capture the way pretend play can transform even the most mundane activities into adventures waiting to happen. And with superheroes everywhere in pop culture, Mantchev offers a fun introduction to what fighting crime is all about for kids who aren’t ready for the latest blockbuster action film.